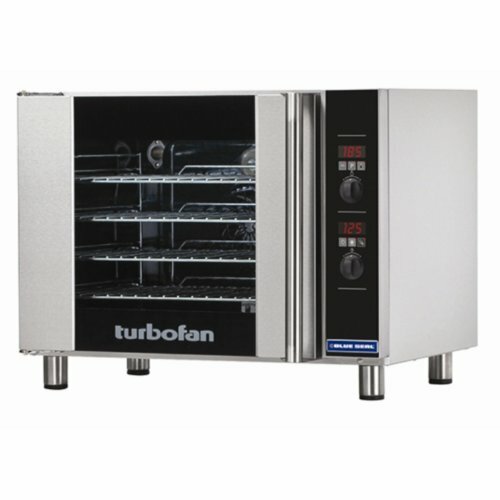 Supplied with 4 wire oven racks Electronic timer (up to 180min) with countdown or time count modes Electronic thermostat control (up to 260°C) Digital display with 20 programmes Quick select grill mode 80mm tray spacing Broil / Grill mode quick select key Capacity 95Ltr Dimensions 625(H)x 810(W)x 616(D)mm Dimensions - internal 425(H) x 565(W) x 395(D)mm Dimensions - shelf size 540(W) x 370(D)mm Fuel Type Electric Material Stainless steel Power Type 3kW, 13A, single phase Temperature Range 50°C to 260°C Voltage 230V Warranty 12 months parts and labour on mainland UK and Isle of Wight only Weight 54kg Hi-value Hotline YES Plug fitted Yes The stainless steel, multifunctional Blue Seal Turbofan Electric Convection Oven E31D4 offers a variety of cooking styles, including its ability to grill, bake, roast and hold a variety of foods, making this convection oven ideal as a primary oven for smaller establishments. It has user-friendly electronic controls with high visibility digital display, electronic thermostat and vitreous enamel oven liner for easy cleaning. Its range of features also includes anti skid adjustable stainless steel feet and side hinged doors with cool touch handles, quick select grill method and up to 20 programmes to choose from.